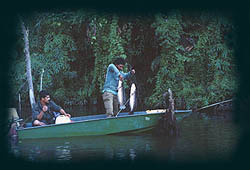 Tasik Kenyir is known as an angler's heaven where fishing is concerned. With the many rivers and tributaries serving as breeding grounds, hundreds of species of sport fishers like the Kelisa, kelah, Toman, Baung, Sebarau and Lampan, just to name a few, are found in abundance. 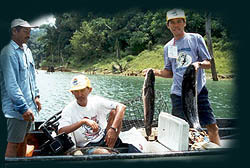 Good fishing sports are at Cacing, Pertang, Leban, Petuang, Saok, Sungai Terenggan and many others. Anglers are advised to arrange for special fishing trips through chalet or private boat operators for the best fishing location. Please be informed that a fishing permit is required from the Wildlife Department.